Hopefully, the National Rifle Association or the Second Amendment Foundation will help Leyla Pirnievsue her landlord. Hopefully, she can get even with her whiny snowflake roommates somehow. Roommates searched room for guns after finding MAGA hat. 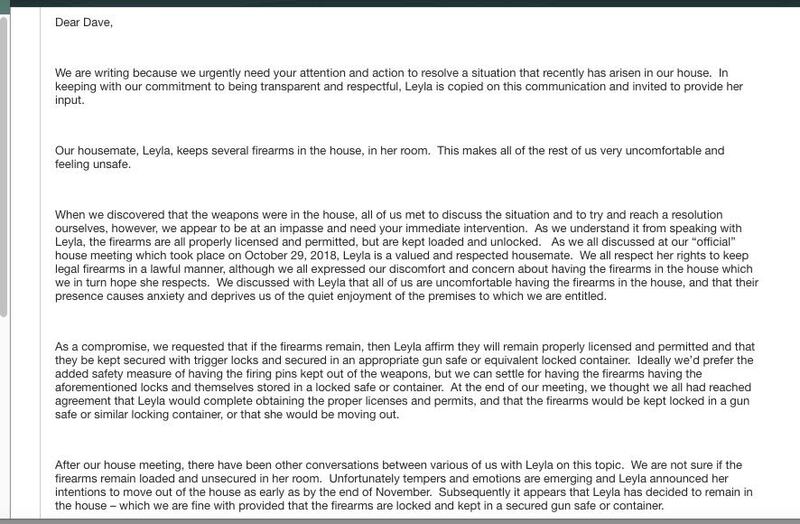 “Since it’s clear that Leyla wants to keep her firearms, it would be best for all parties if she finds another place to live,” Dave Lewis, president of Avid Management, said in an emailto the household obtained by the Washington Free Beacon. 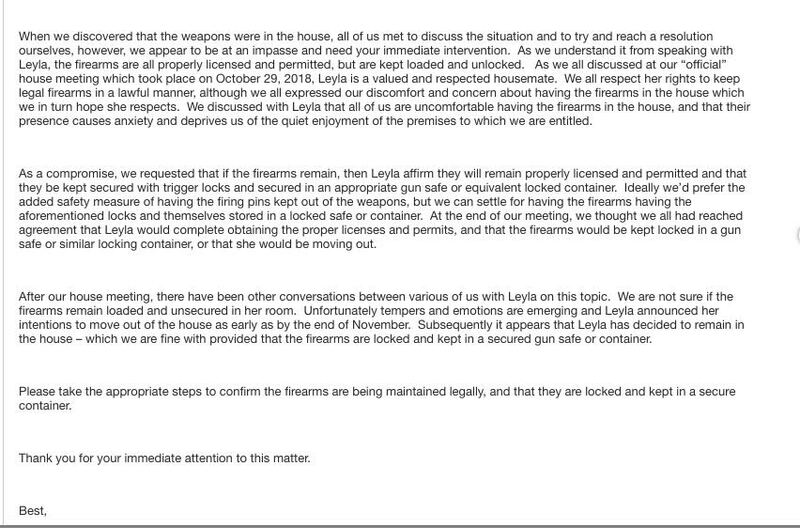 The request that the student, Leyla Pirnie, move out came after her roommates searched her room while she was not home and found her firearms. That prompted one of the roommates to email Lewisrequesting he verify that Pirnie was in compliance with applicable firearms laws. 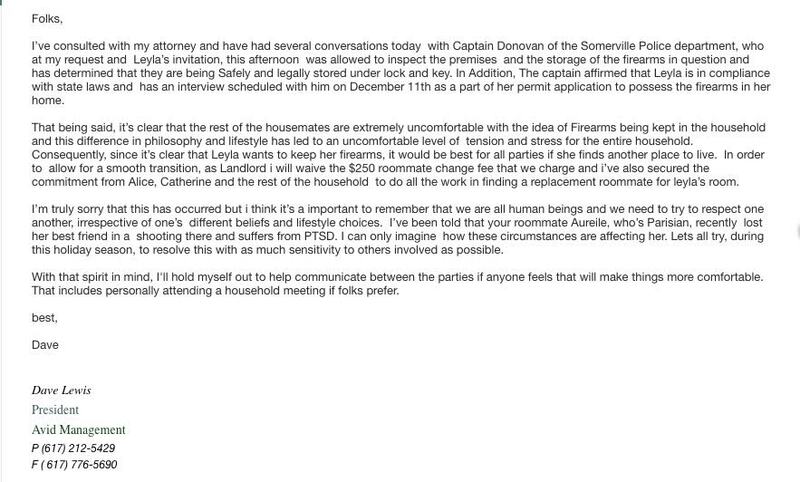 In response to the email from Pirnie’s roommate, Lewis contacted Captain James Donovan of the Somerville Police Department to inspect Pirnie’s firearms and ensure they were in compliance with Massachusetts law. Pirnie agreed to allowing the police to inspect her firearms and said she was told she is in compliance with all applicable laws. 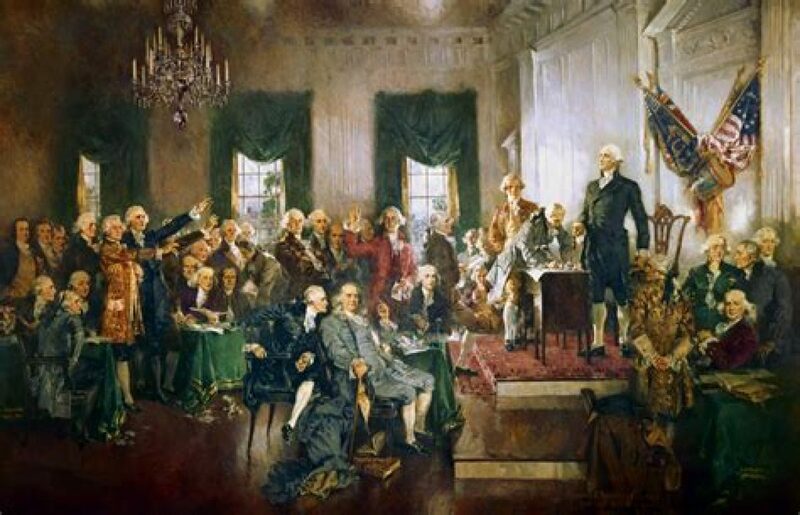 Lewis acknowledged the department’s conclusion that Pirnie was not breaking any gun laws in his email telling Pirnie to move out. She said her landlord’s concern over some of her roommates being uncomfortable with legally owned firearms is misplaced and his request that she move out is inappropriate. When Pirnie and her father rejected Lewis’s request that she move out in the middle of studying for finals, Lewis responded by saying his request “was based strictly on practical and not idealogical (sic) terms.” He then warned that if the other roommates moved out Pirnie would have to pay their rent. Pirnie feels she’s being punished for being a gun owner. “I’m still very much so being threatened out of my apartment,” she said. “Either I leave and incur moving expenses or my roommates move and I incur their rent expenses… Doesn’t seem right.